The top eight seeds are through to the quarterfinals of the state tennis singles tournament, which holds a homefield advantage for the five remaining Big Island athletes. On the boys side, it’s No. 4 seed Isaiah Brilhante of Waiakea and on the girls side, it’s Hilo teammates No. 4 seed Emily Soares and No. 7 seed Diana Wong. Bryce Zeffert of HPA, Shaun Kagawa of Kamehameha Schools Hawaii and Keanu Travalino of Kealakehe were stopped in the Round of 16. 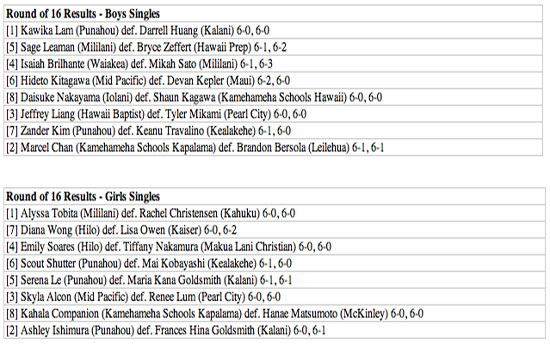 Makua Lani Christian’s Tiffany Nakamura and Kealakehe’s Mia Kobayashi also crashed out in the Round of 16. Meanwhile, No. 4 seed Jake Frogley/Brendan Moynahan of HPA powered through the doubles Round of 16 to be the sole Big Island representative left in the boys draw. 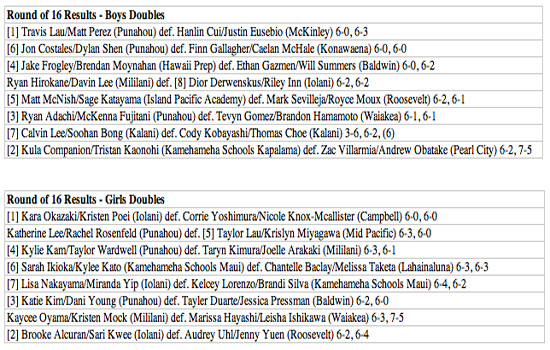 Konawaena’s Finn Gallagher/Caelen McHale and Waiakea’s Tevyn Gomez/Brandon Hamamoto were ousted in the Round of 16. In the girls doubles bracket, Marissa Hayashi/Leisha Ishikawa of Waiakea were the last Big Island team standing, but fell short in the Round of 16. The tennis state tournament continues through Saturday at two North Kohala resorts — the Fairmont Orchid Tennis Center and the Mauna Lani Bay Hotel Sports and Fitness Club.